Merz & Son 7 1/4-inch astronomical lens, used at Sydney Observatory. Made by Merz and Sons in Munich, Germany, 1860-1861. In 1860 Reverend William Scott, the first astronomer appointed to the new Sydney Observatory, ordered a new 7 1/4 inch refracting telescope. Arriving in June 1861 it was made by the German firm of Georg Merz & Sons (1793-1867). This lens also made by Merz & Sons was used in conjunction the Merz telescope. Like many of the instruments ordered by the observatory this telescope and lens were not without problems but overall they appear to have been a good purchase. 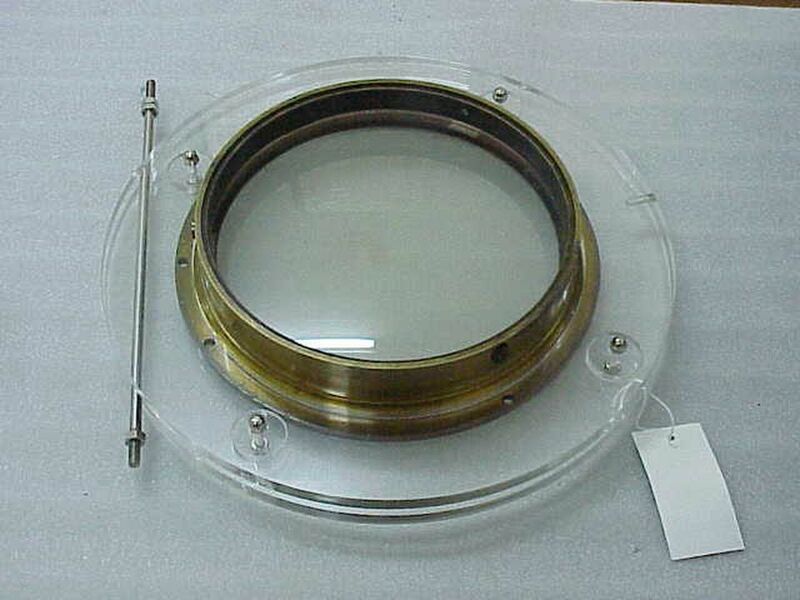 Circular telescope lens in a brass casing, lens secured to the casing with 3 screws, 5 screw holes in the projecting outer rim. Called an objective glass lens, the lens has a focal length of 315cm (10 feet 4 inches). Cited in reference to Observatory stock number 41, 'Old Astrograph'. The lens was made by Merz and Sons in Munich, Germany between 1860 and 1861. The company of Merz and Mahler was a direct inheritor of the, 'Optical Mechanical Institute' of Munich, previously operated by the German opticians Fraunhofer and Reichenbach. From 1826 Merz managed the 'Optical Mechanical Institute' with J. Mahler and in 1845 Merz took sole charge of the business. At the 1851 exhibition Merz and Sons were awarded with a Council Medal, the highest award, for their equatorial telescope. His sons inherited the business and when one of them Sigmund died ownership passed onto Sigmund's cousin Jakob Merz who sold it to Paul Zschokke in 1903. Merz optical lenses combined flint and crown glass lenses and were used in some of the largest refracting telescopes in Europe and America. German opticians dominated the optical business for much of the nineteenth century as the best optical glass, free of imperfections, was made there. According to the blue file, the lens was part of the first major telescope at the Sydney Observatory. It was used as a guide telescope lens for Sydney astrograph from 1890-1947. Owned by the Sydney Observatory.